as anyone who reads the blog regularly knows, i collect early photographs related to music, and am partial to images of records and record players. when a fellow collector led me to this photograph on ebay, it was of course mainly because of the prominent image of a giant "morning glory" victrola horn in the picture. i thought the dealer wanted a bit too much money for a somewhat morose looking old woman and a flowery speaker horn until i noticed the framed portrait hanging on the wall behind the subjects. this framed photograph, probably a wedding portrait, clearly pictures the same woman, quite a bit younger, along with a gent, whom i would assume must've been her husband. the fact that we see the woman in the photograph twice, in different stages of life, is quite incredible. it is through these two representations of time, within a single photograph, that we can compare the woman as she was in youth with the woman she is in life, as photographed... you can compare the two faces and follow the passage of time. for those who may not know the story of the original victor dog mascot and the ad line "his master's voice", it referred to the idea that a dog's owner could record his own voice for posterity, and after he was dead, his voice would reproduce so clearly when played on a victrola, that the dog (whose head is slightly bent in confusion) would believe he was hearing his master speaking to him from the dead. in light of this, it certainly is no great leap to imagine that the relationship between the earlier wedding picture and the latter image of the woman, "partnered" with the victrola instead of her husband, suggests the recordings and playback mechanism as a surrogate for what has passed through life and is now (at the time the photograph was taken) gone. there she sits alone in a chair accompanied by a mute gramophone, which may or may not comfort her in her loss and loneliness. her hairstyle seems to remain the same, but her "love" is clearly missing. resonating note of space, in which i believe"
i picked up this beautiful albumen photograph of an ice formation in the sea at the flea market on sunday (i would highly recommend clicking to see in a larger size!). as i was looking at the photograph, deciding whether or not to buy it, it began to suggest a small painting by arthur dove, which in my mind's eye felt as if it had some sort of formal visual equivalent to the image in the photograph. when i returned home, i spent a half hour or so trying to find my dove books, and finally uncovered frederick s. wight's book on dove from 1958. this book, which i discovered as a student, in a library in paris, many years ago, was my first introduction to dove's work, and the images, as well as some of dove's own writings, planted the first deep seeds of abstraction within me. it was also in wight's book that i first saw a color image of dove's 1910 painting, abstraction no. 2, which was part of a series of 6 very small paintings, purported to be the first truly abstract paintings made in america. in the second image of dove's painting, just above, i have flipped it over, to force the painting into a literal visual relationship conversation with the photograph. of course, the black outline does suggest devilish horns pointing upwards, but the idea of the necessity of flipping the painting to make the connections work becomes too forced, and suggests, rather presumptuously, that dove's work must conform to my mind and an old anonymous photograph, rather than that i must work to get closer to whatever connections exist between two things as they are. certainly the main form in dove's painting (seen right way up), and the ice form in the photograph, occupy a similar subject/ground relationship, as well as both inhabit a similar amount of pictorial real estate. also the larger black area in the midst of dove's shape certainly corresponds to the window-like cavity in the ice form... but within these few simple, and relatively meaningless, connections, i wonder if this whole situation should even be thought about in relation my eyes at all. i would like to think of a "connective feeling" as something being birthed from simple gut reaction that moves vibrationally towards my emotions, and perhaps, also working a at times upon my memories - memories that perhaps relate dove's colors to some moment of visited sea, or perhaps, in relation to a time in my life, or to some object or image that holds parts of dove's abstraction and the iceberg within it. perhaps my insides can sense or see some thing or idea that suggests a sturdy bright pink twine binding these two things together -not just in feeling, but through logic that could be articulated with clarity... but surely, this is not the case. to my "knowing" self, it is really a matter of being just out of reach, where some ethereal and stubborn string, is so invisible to my own eyes, that whatever path i would need to walk to come upon such conclusions, could not be found. as always, it within this space of distance and disconnect that i find to be the richest. in these spaces, these two images feel connected, regardless of whether or not i can articulate such connections in detail. the truth is that i'm still enamored with the way an image can make one person feel happy or another sad, or how one seems to be good, while another is somehow bad. our response to images is quite subjective, and images generally contain such a wonderful ability to confuse things inside of us - acting as triggers of potential, towards self awareness and at the same time, creating a confused and unresolved situation that one can only really come to terms with through a kind of letting go of rational thinking - to see these things as double sided, one as it is in the world, and the other as it feels inside of us and how it plays upon our memory and mind. this convoluted flux is proof that parts of our insides are continually at work, even though we are seldom allowed to access their secrets. when i try to compare dove's painting and the iceberg photograph, their connections are strongest when i am not thinking, and in a state of unknowing. (and so it must be that it is in that place, within the mind, where one of these two similar, yet dissimilar, things is erased, so that it can become different in mind than it is in reality - transformed, translated, or transcribed - suddenly feeling closer to its sibling in appearance inside, than it is as seen on the outside, only with eyes). 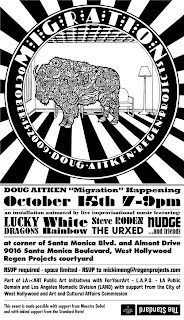 very excited to be invited to perform at an event for the closing of doug aitken's recent installation - migration - at regen projects gallery. the even will include 5 live improvised soundtracks to doug's installation film, which features an array of exotic, domestic, and aquatic animals in pristine motel environments. i have known doug for years, and have contributed sound to a number of his installations, and we have collaborated in the past on sound works and an edition, but this will be the first time i will work with an entire film of his. peformances are 7-9, i have no idea what time i will be playing... some other stellar performers on the bill as well. in 1962, the topps company, manufacturer of baseball cards and bazooka bubble gum, created a "non-sport" bubble gum card set called famous americans, featuring numerous personalities from american history. one of the stranger inclusions was a card featuring frank lloyd wright. seeing as every young boy has dreamt of one day seeing himself on a baseball card, i kind of feel sorry for wright, as the set containing his image hit the dime stores and newsstands 3 years after he'd died. at one point, maybe 8-10 years ago, the topps company began to sell their own archive of original art for numerous sports and non-sport sets. having been a voracious card collector when i was a kid, i was constantly watching to see what they might pull out and sell, hoping to win a piece of art of some sacred collected object i had as a kid. unfortunately not much from that era came out, and most of what did, was insanely expensive. while it came from a set that was released a few years before i was born, i was intrigued by the wright art, because i believe he was the only architect to ever appear on a bubble gum card; but because there are a ton of folks who collect wright related ephemera, i couldn't imagine being able to buy it... i figured it would sell for crazy money. fortunately, the bubble gum card collecting community had little love for architects, and not another soul was interested; and so, i managed to win it for a song. if you are around my age and grew up in southern california and watched cartoons and wonderama on sunday mornings you surely saw the commercials for lawrence welk's musical spoons; and if you ever wandered over to thrifty's, you encountered on a toy rack, a pair of thin metal spoons joined in a blue plastic handle, that when "played" made a pretty strange percussive clicking sound (very good perhaps for making "clip clop" horse walking sounds...). i've been collecting music photographs for a long while now, and one of the exciting things about these images, beyond their aesthetic pleasure and wonder, is that there are many instruments i have yet to encounter. one such recent discovery was this first photograph i have ever seen of someone playing a form of "musical spoons", and i must say the fact that he is actually playing them makes it quite special. addendum: an astute and musicologically inclined airforms regular, jeremey, pointed out that these are indeed "bones", with a link posted in the comments for this post towards a wikipedia article, which also led me to a pretty wonderful video of someone playing bones along with a banjo that you might want to check out here. here are a series of drawings from 1951 by frank colton illustrating various square dance positions. at the library book sale a few weeks ago, the square dancing book was in a box leaning against a book about dances in ancient egypt, and while i have little interest in either subject the fact that they were touching and 50 cents each suggested i take them home and someday perhaps find some connective tissue between them. when i thumbed through the square dance book i was instantly taken with the incredibly odd quality of colton's drawings, perhaps mostly because of the strange perspective, as if we are sort of looking down at the dancers from the sky (or at least a small tree...). colton's drawings immediately brought up some of warhols early works, the dance step patterns, but also simply his use of newspaper images, etc. 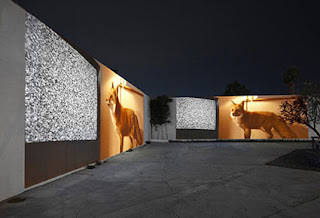 i think it is somehow connected to translation, or a kind of transformation that took place in warhols works when printed images were enlarged and then silkscreened; and in colton's case, i'm guessing, when ink drawings are made from photographs rather than life. there's a kind of awkwardness to these drawings, although not really connected to colton struggling to draw, as much as these poses and view seem disconnected from how one would choose to draw them from life. of course, the angle he chose relates to purposeful diagramatics, as opposed to aesthetics (although the strangeness probably oozes from them due to both).